This instirution is entrusted with the role of promoting and regulating the communications and multimedia industry and to enforce the communications and multimedia laws in Malaysia. SKMM was established in 1998 pursuant to the provisions of the Malaysian Communications and Multimedia Commission Act 1998 (MCMCA). SKMM implement and promote Malaysian Government's policy objectives for the communications and multimedia sector. SKMM also oversees the new regulatory framework for the converging industries of telecommunications, broadcasting and on-line activities, in accordance with the Malaysian policy objectives set out in the Communications and Multimedia Act 1998 (CMA), as well as postal services and digital certifications. 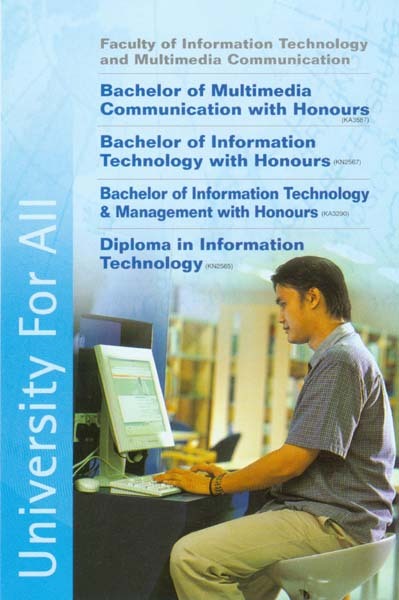 The faculty currently offers courses leading to the Bachelor of Multimedia Communication with Honors, Bachelor of Information Technology with Honors, Bachelor of Information Technology & Management with Honors and Diploma of Information Technology. Each course is designed to cater for a career in Information Technology, Multimedia and Communication and to equip with the various aspects of mass and human communication theory and practice. Graduates of these 4 courses are open to a wide range of job opportunities in the fields of Information Technology, Multimedia and Communication at the supervisory, administrative or first line management level. completion is 6 academic years (18 semesters). Fees for the Bachelor Degree courses is RM 150* per one credit hour. will depend on the number of credit hours taken during that semester. Diploma from an IPTA or IPTS. of Education) with credits in any three (3) subjects. a- Processing fees of RM25 in the form of bank draft or postal order made payable to UNITEM Sdn. Bhd. There are more than 24,000 students enrolled in OUM programs. OUM’s vision is to be a leader and innovator in open learning.